The first ever National Eisteddfod lecture to be organised by the Plaid Cymru History Society focused on the life of Gwynfor Evans and took place on 6 August 2012. 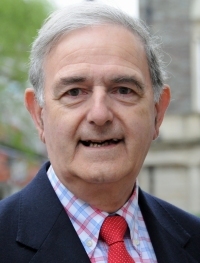 It was delivered by Peter Hughes Griffiths, Plaid Cymru’s council group leader on Carmarthenshire County Council who served Gwynfor and Plaid Cymru as full-time organiser in the county. An extended version was given in Carmarthen on Friday 5 October as the Enid Jones memorial lecture. The Society is grateful to Peter for permission to reproduce the lecture on our website and to Councillor Alun Lenny for his kind help in supplying the photographs. This text has been translated from Welsh by Dafydd Williams. The opening sentence of the Welsh Academy’s Encyclopaedia of Wales describes him in this way: “The greatest patriot of 20th-century Wales, his dedication to his country did much to transform the national prospects of the Welsh people”. He received the Fellowship of a number of our colleges as well as serving as President of the Day in the National Eisteddfod more often than any other person in our time. Capel y Tabernacl in Barry was spiritual home for the entire family, with Gwynfor’s mother and father playing leading roles and his grandfather the Reverend Ben Evans its first minister. His father was a deacon and conductor of the mixed choir of over a hundred voices that performed the major oratorios on a regular basis. In the year 2,000 a new stained glass window was unveiled to honour the lives of Dan and Catherine, who set up well known, flourishing businesses in Barry town. 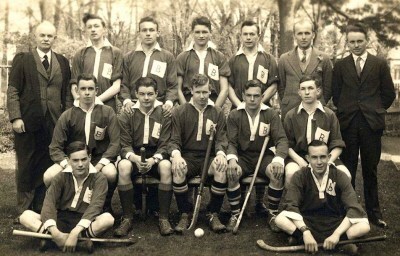 Gwynfor attended Barry Grammar School where he captained the school’s cricket and hockey teams, and was selected to play in the Welsh Schools Cricket Team in 1930. Then it was off to University College, Aberystwyth and a law degree – and selection to play in the college cricket and hockey teams once more. While in University, there took place two events that would have a strong influence on his later life – the first: “I would marvel at the dedication of the young men and women who sold Y Ddraig Goch on the streets of Aberystwyth – Gwenant Davies, Eic Davies and others.” And secondly – “but one day he saw a yellow coloured pamphlet outside a bookshop in Aberystwyth – The Economics of Welsh Self Government by DJ Davies. 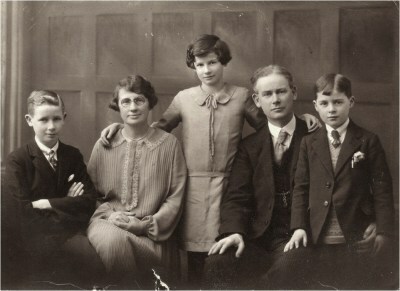 This booklet removed all kinds of doubt, and in the summer of 1934 he approached Cassie Davies in Barry and joined the national party.” At the time Cassie Davies was a member of staff at Barry College and in her book Hwb i’r Galon she recalls – “And this was the time that a remarkably good-looking young man from Barry, wearing an Aberystwyth college blazer, began to call to talk about this new party and ask to join it.” Gwynfor then went to Oxford University where he set up a party branch and became secretary of the famous Cymdeithas Dafydd ap Gwilym. He graduated there in 1936. 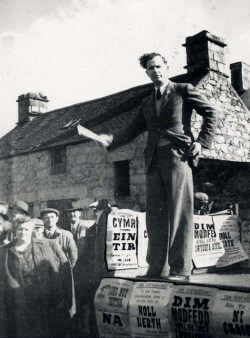 Although he was to send an article from Oxford for his old school’s magazine, parts of which appeared in the Western Mail, it was in January 1937 that he published his first full article in Y Ddraig Goch, dealing with the establishment of the St Athan camp, and in the Plaid Cymru Summer School in Bala the same year he proposed a motion calling for official status for the Welsh language. And guess what – 400,000 signatures were collected in support of the proposal before the Second World War put paid to that effort. So you can see that Gwynfor had already made his first major strides in what was to be his life’s work – for the sake of Wales. He became a member of Plaid Cymru’s national executive in 1937 and within six years, in 1943, he was chosen as party vice-president. Then on 1 August 1945 in the Llangollen conference (five days before the bomb was dropped on Hiroshima) he was elected as President of Plaid Cymru at the age of just 32, the start of his great lifetime mission – he would remain president and leader for the next 36 years. In the meantime he had married his lifelong partner Rhiannon and was living in Wernellyn, Llangadog where he launched a market garden venture. I like his description of how he fell for Rhiannon. 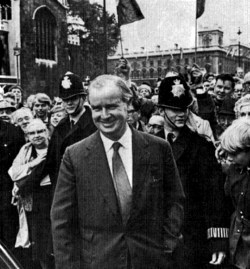 In his autobiography Bywyd Cymro, available in English as For the Sake of Wales, Gwynfor describes how he called on Rhiannon’s parents in Cardiff – “I have to confess that my heart lost a beat the moment Rhiannon walked into the room. On seeing her again two months later amid the beauty of a summer’s day at Islaw’r Dref dressed in a very short light frock – beach wear no doubt – the boy from Barry fell head over heels in love!” They were married on St David’s Day 1941, and Pennar Davies says in his book that if heaven had ever arranged marriages this was surely one it had done well: “And the contribution of Rhiannon Evans to the work of her husband cannot be overestimated.” Gwynfor contested his first Parliamentary election in Meirionydd in 1945. 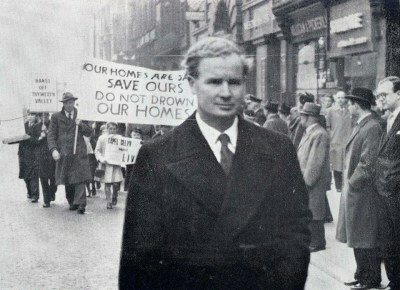 He led the Llyn y Fan protest on New Year’s Day 1947 and that in Abergeirw in 1948 and was elected a member of the University Court’s Guild of Graduates and of the Welsh Independents the same year, as well as serving as Welsh Secretary of the Celtic League in the Colwyn Bay National Eisteddfod as early as 1947, when he was 34. 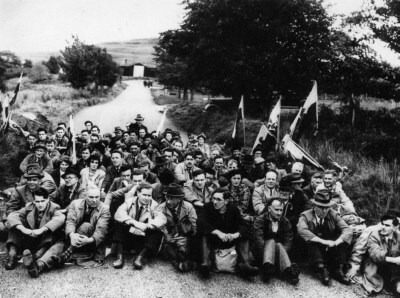 It is evident that by the end of the 1940s Gwynfor Evans had established himself as a national leader with wide support among his people. He lost the General Election that followed the Referendum because of publication of a BBC opinion poll days before the election that predicted that Gwynfor would come a poor third. In my personal opinion all this had been arranged by the ‘establishment’ to get rid of Gwynfor from the House of Commons. In fact, the BBC admitted following a detailed review of the company that carried out the opinion poll that were unacceptably far from the mark! Gwynfor’s response was – if he had won that election, with his health as it was at the time, he would no longer be in the land of the living! 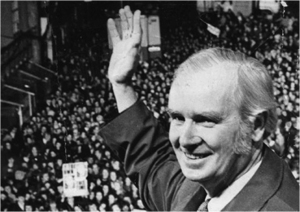 And then in 1981 after 36 years as President of Plaid Cymru Gwynfor stepped down from the helm in the Conference in Carmarthen. That is a quick sketch of the work and impact of Gwynfor in the field of politics. 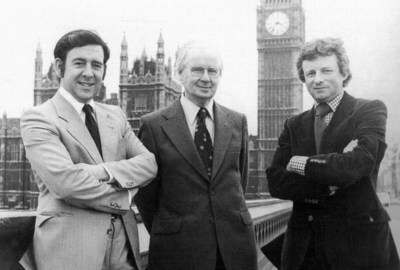 It was a very profound impact, and we would never be where we are today but for Gwynfor having accomplished so much. His political success is now acknowledged by everyone. A very very special man. But what is truly remarkable about this man is that he accomplished so much side by side with his political career. And what I want to do now is give you a taste of those accomplishments, and remind you of the other tremendous pioneering roles he played. And where should I begin? Gwynfor would almost invariably begin every speech with a history lesson. It didn’t matter where, or what was the occasion, the history of Wales was part of the message. He believed it was very important that we as a people should get to know our history. He campaigned to teach Welsh history in our schools – at a time when that was virtually non-existent, and he set about writing and publishing books, and encouraging others to do the same – “Gwynfor’s aim throughout his life was to awaken national consciousness through imbuing people with the history of Wales, restoring their memory and strengthening their desire to live.” (Dr Geraint Jenkins) He wrote history classics –Hanes Cymru/ History of Wales, through the South Wales Echo. Then Aros Mae, Seiri Cenedl y Cymry and Land of My Fathers. Picture him setting out on Christmas Day 1970 to write the first two pages of notes for Aros Mae! It was on sale within 7 months, with the first edition selling fast and a second edition soon in hand. Elin Garlick set about a translation into English, entitled Land of My Fathers. Three reprints were to follow and the publishers Tŷ John Penry commented– “this was the best seller of all the books we have published.” His other historical classic is Seiri Cenedl y Cymry, available in English as Welsh Nation Builders, portraits of the history of 65 men and women who contributed in different ways to the building and development of our nation. Think of all the research work needed to write historical studies and get the facts right! 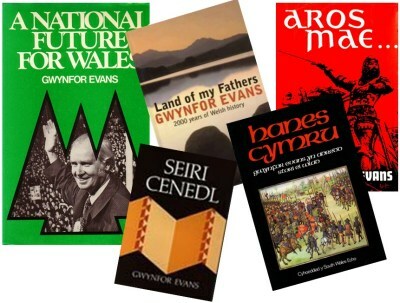 Gwynfor was a prolific author – of some 30 books in total – as well as pamphlets, leaflets and numerous books, in Welsh and English. He told me once of his intention to write one more book based on all his travelling around Wales – a study of Welsh chip shops as he had eaten in so many of them as he criss-crossed the country! We heard the Reverend Beti Wyn James and Mererid Hopwood assessing the significance of Gwynfor’s contribution in these two fields in the memorial service held in Capel y Priordy on Sunday 2 September. So I shall just summarise some of the main features. Gwynfor was a teacher in the young people’s Sunday School in his chapel, Providence Llangadog, for many years, and what is special id this – wherever he had been on the Saturday night – he would almost always return for his Sunday School class the following day. Read the full chapter about Gwynfor the Pacifist in the book by Pennar Davies – it gives us a comprehensive and detailed picture of the depth of his thinking and his faith. 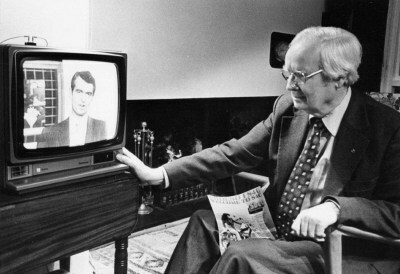 Gwynfor played a vital role in the campaign to secure a radio service for Wales – in 1939 the BBC removed programmes about Wales completely. 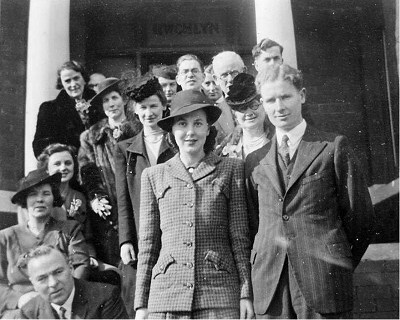 In the National Eisteddfod in Llandybie in 1944 Gwynfor gave a lecture to a packed chapel on Radio In Wales. The lecture was published in Welsh and in English and 10,000 copies were sold! Gwynfor argued for devolution in the field of broadcasting, and to cut another long story short – this was successful and he was elected as a member of the BBC’s Welsh Advisory Committee in 1946. Although it would be a long battle, BBC Wales together with Radio Cymru and Radio Wales were secured later on. This entry was posted in Publications on 06/10/2012 by admin.